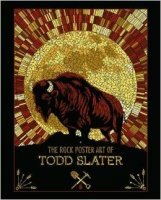 Todd Slater is one of the world's leading contemporary artists for Rock poster art, with every new release selling out in a matter of minutes. A quick view of his website confirms that he is certainly a prolific and successful artist. His ascent to fame has been fairly rapid and his client base covers many big names such as Neil Young, Foo Fighters and Pearl Jam. This is a lavish 13x10.5 inch hardback book with two hundred and forty four high gloss pages covering Slater's work in colourful detail. The posters are eye-catching gig advertisements – effective and ultimately collectable. Slater's change of styles in the last decade is notable; clearly not one for resting on his laurels, he appears to constantly revise his technique and remains on the leading edge of graphic design. The first five hundred copies of this book contain four signed and numbered prints which could well be a good investment!